Easy color scanning whether you are a mobile professional or using at home. Quickly scan and save images of documents like invoices, statements, letters, or pictures in Adobe Acrobat, JPG or TIFF file formats. Simply connect to a computer via the included USB cable, and you are ready to go. Getting organized has never been so simple. Lightweight and portable, it won"t take up much room in a briefcase or on your desk. Since it's powered by the USB system in your computer, you don"t need any batteries or AC power supply. You can scan media that is the size of a business card, up to 8.5" x 14" legal size documents, all at up to 600 dpi. Perfect for scanning receipts, news articles, handwritten notes, school papers, photos, recipes and more. 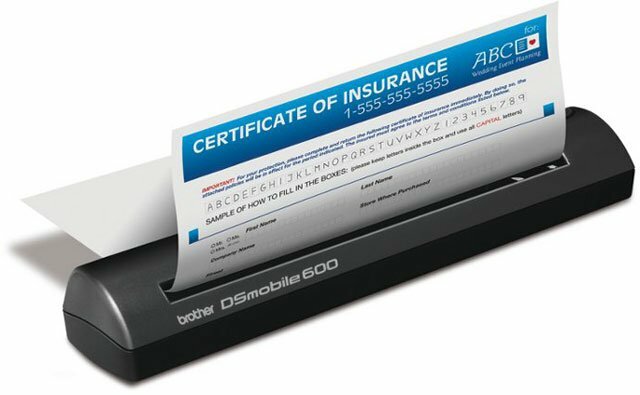 So simple to use, the DS600 is the perfect scanning solution to help reduce paper clutter and help get better organized. The Brother DS-600 is also known as DS-600	or DS600	.